Don't you just love the look of the boy in this photo? Isn't that the look of someone who loves learning. I am hoping you'll find the information I'm sharing today helpful in getting your kids fired up for the new year! Today, I'll be sharing with you another installment in the Top 10 Websites series. This month, we'll focus on math. 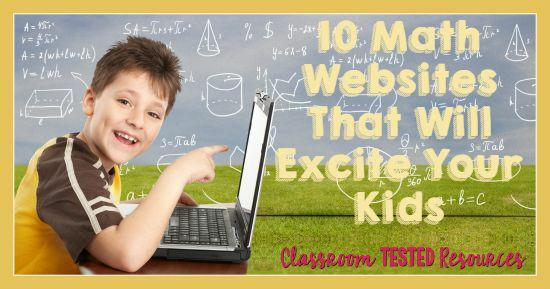 Last month, after our reading post with Top 10 Literacy Sites went up, we got requests for math websites too. Well, I am obviously a literacy gal, however, I have used a few great sites in the past few years when I was asked to provide remediation for math, and I also consulted with a few math gurus too. I'll share those as well, and at the end of my post, I'll set it up as I did the literacy post (with a linky). Please feel free to add your favorite sites there and elaborate in your comments on how you use them. So, let's get started. The first website was actually developed in the state of Virginia and is fairly new. It is called Sumdog, and it's aligned to the Virginia standards. However, that doesn't mean that Common Core teachers can't use it. To try it out, you can log in as a guest for free. You won't be able to save the data, but your students can still see how they like using it. I loved that I could select fractions and see exactly the degree of difficulty students would encounter. It is intended to be used more as a practice site after instruction. The second website is used for modeling. I discovered Virtual Manipulatives by accident one day when I was looking for reading materials on a site for special education. To get the full version from the National Library of Virtual Manipulatives, you have to get a $30 license, but McGraw Hill's app works well for modeling too. The selection is not as great as NLVM, but it is free. You can access the free version [here] and the link below is for NLVM. Next up is Mr. Nussbaum's Math Lab for Kids. This is another website I discovered by accident. I was asked to provide remediation services for our kids who had failed the Virginia Standards of Learning test the previous year. Well, remember that I'm a literacy gal, so therefore, I had limited materials for math. Yes, I taught in the classroom for 15 years before becoming a reading specialist, but that meant that most of my math materials were old. Mr. Nussbaum's website was actually fairly new at that time, and since, it's been greatly expanded. It too was created by a Virginia teacher, so it aligned well to our curriculum needs. Even so, anyone can use it. I love that you can use it for modeling and practice. He has the activities clearly labeled...decimals, fractions, place value, graphing, etc. It is one of the best in my opinion. Number four is simply called Math Games. After reading The Techie Teacher's post, I went to check it out myself. I love anything that allows the teacher to search by skill and level, so I knew right off this would be a great site. The second bonus is that it is free. (Insert crazy teacher cheers) I can see using it for both modeling and student practice. When I did a preview on "equations", I loved that it presented me with a word problem. Beside the problem, there is a scratch pad for student use, instant feedback, and levels for those kids who work to get to the next one. This one is aligned with Common Core. Khan Academy is site number five. It has actually received quite a bit of praise in the media and for good reason. It offers tutorial advice for students from kindergarten up. It does have a gamelike feel with avatars and progress stats. 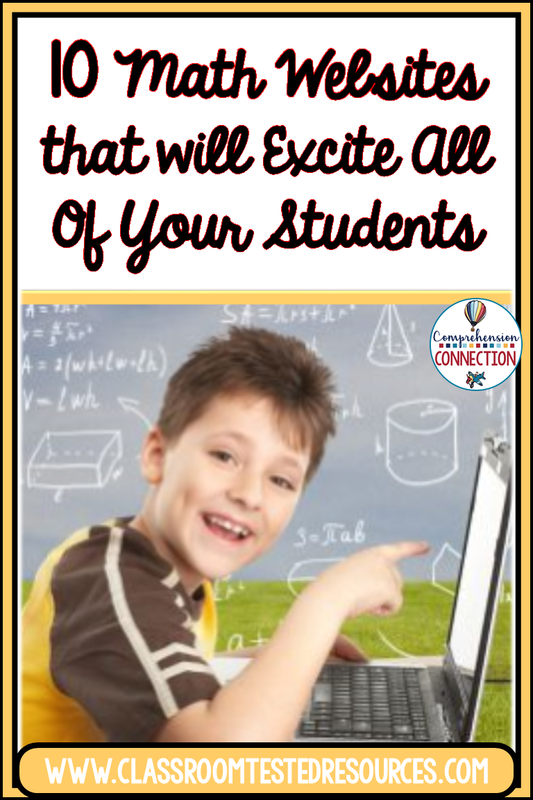 Students can select what they need help on as well as work from beginning to end for their grade level. It too is organized by topic...operations, geometry, fractions, etc. Multiplication facts and concepts seem to be challenging for our students in grade three through five, so my number six site will hopefully help you address this issue. Multiplication.com offers teaching tools as well as practice games for students. You can check it out with the link below. Next up is Illuminations. This database of teacher lessons and materials is aligned to the Common Core, and offers complete lessons to address each skill with some interactive activities. It was created by the National Council of Teachers of Mathmatics and is a virtual professional learning community for math. Have enough information yet? It's a must visit site. We're approaching the end, but this site is one that is worth the price and certainly worth mentioning. IXL is a great practice website for struggling students as well as those on track. It offers games and activities by standard, so it's easy for teachers to match student practice with lessons. Students can work at their own pace both at school and home with the same license. For parents, it is very reasonable even if a school division isn't able to provide it, so as teachers, we can recommend it if a child needs an extra boost. The site also has reading support available too, but I have not reviewed this component of the program. Last but not least, I'd recommend HoodaMath for lots of math fun. This site can be tailored to the topic, specific skill, and level you need and offers lots of practice games targeting those skills. It is intended for grades K-12, but may be more appealing to elementary and middle school levels. What are your favorite math websites? If you have a minute, link them up below. Please put a $$ sign in front of any that are by subscription only, and if you're interested in additional help in this department, be sure to let us know. Have a great year, and come back soon.